Get a Rescue Alert Window Sticker that lets emergency workers and others know how many pets are inside your home. Stickers are free from the ASPCA and from some pet stores or veterinarians. Especially for dogs: Extra leash, toys, chew toys, and enough cage liner to last a week. Arrange a Safe Haven and Caregivers. If it isn’t safe for you, it isn’t safe for your pets, so don’t leave them behind. Not all Red Cross disaster shelters accept pets, so it is imperative to make an evacuation plan for them ahead of time including identifying hotels outside of your immediate area that accept pets and asking friends and relatives outside your immediate area if they would be willing to take in your pet. Establish a permanent caregiver should something happen to you. Bring pets indoors. Pets can become disoriented and wander away from home during a crisis. Call ahead to make arrangements for boarding your pet outside of the danger zone at the first sign of disaster. 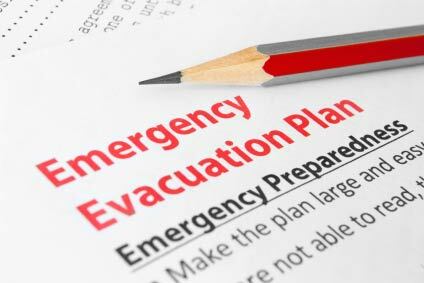 If emergency officials recommend that you stay in your home, determine which rooms offer safe havens. These rooms should be clear of hazards such as windows and flying debris. Fill up bathtubs and sinks ahead of time to ensure that you have access to water during a power outage or other crises. If you keep other kinds of pets, the ASPCA lists special considerations for birds, reptiles and small animals that are important to read.